The Old Granary will be completed in spring 2019. It stands attached to its sister barn, The Shippon, both part of an exciting development of three individually distinct, barn conversions, all of which were once part of the original working farm. Also part of the development is Cherry Barton. The development is surrounded by fields and has far reaching countryside views. • Cabled ready for sky and data networks. • Garden across drive with new 6ft x 8ft store shed. • Holsworthy 7 miles, Bude 12 miles, Bideford 14 miles. All ground floors have underfloor heating and the first floor bedrooms are heated by radiators. All internal doors are ledged, planked solid oak with hand forged, pewter ironmongery. - a spacious open plan room with beams, soft walls and exposed stonework. Kitchen with polished natural slate work surfaces, gas hob, electric oven. Traditional white ceramic inset sink. Integrated dishwasher. Wood burner set on slate hearth. Craftsman-made oak and glass staircase brightly lit by two west facing windows. Under stairs cupboard. 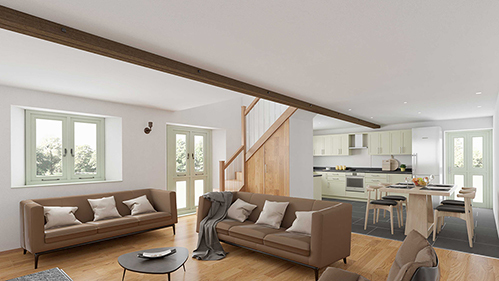 - a characterful room with vaulted ceiling, exposed beams two windows and roof light. Ensuite with 900 x 1200mm walk-in shower with drencher head and standard shower head. Bespoke oak and slate basin unit. Toilet. Heated ladder towel rail. Tiled floor. Utility room (2.37 x 2.9m / 7'9" x8'10") with sink, boiler and storage cupboards and a separate toilet. Bedroom two (3.5 x 5.3m / 11'6" x 17'5") with original exposed A frame, soft walls and full length bespoke window. Family bathroom ( 1.7 x 2.8m / 5'7" x 9'2") with bath, sink, toilet and separate walk in shower. Electric underfloor heating. Bedroom three (3.5 x 5.3m / 11'6" x 17'5" max) with original exposed A frame, soft walls, full length bespoke window. All is cabled ready for sky and data networks. This lovely, traditional, old stone barn was originally used as a granary. The grain being carried up the stone steps at the back of the building to the grain store above which are now the bedrooms. Now a beautiful, welcoming home filled with character. The garden sits immediately opposite across the drive, bordered by a hedge bank on two sides. There is a new 6ft x 8ft garden shed in the garden for storage and wood store. Allocated parking for two cars. Immediately to the back of the property is the original Honnacotts farmhouse. Mains electric, mains water, sewage is your own treatment plant underground in the garden, the property's gas tank is also underground in the garden. Please note: Neither the treatment plant nor the gas tank is shared with any other property. 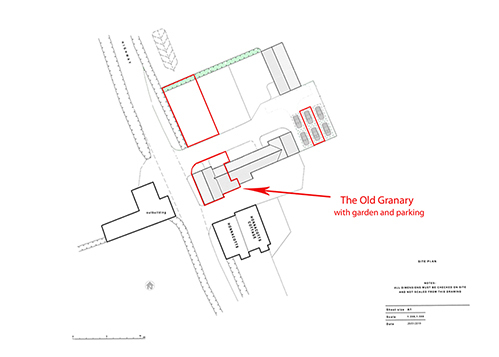 For loads more info on the property, please download the additional information sheet 'A dozen great reasons to live at The Old Granary'. Bradworthy has the largest village square in the county. It is a lovely self-contained village with a post office / Costcutter, general stores, doctors surgery, garage pub, church, an excellent Academy primary school and more. The stunning, wild and rugged North Devon / Cornwall coast lies within easy reach some 12 miles away with small secluded coves and long sandy beaches. Perfect for walking, swimming, surfing and kite surfing. Holsworthy, the nearest market town is seven miles away with a Waitrose store, 24hr M&S garage and a weekly farmers market held in the square. 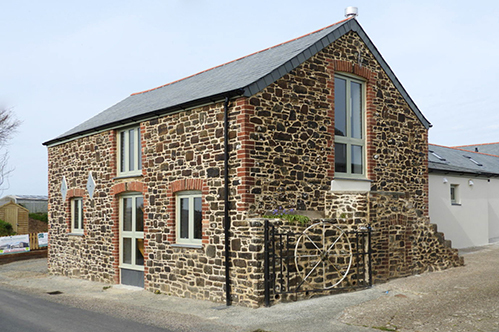 Bude is 15 miles away with it's popular sandy beaches, sea pool and highly regarded surfing school – Also access to the cyclists Tarka Trail. Barnstaple, North Devon's largest market town great for shopping and with the North Devon district hospital is 40mins. Exeter with access to the M5, airport and shopping is 1h 10mins away as is Tiverton with access to M5. Newquay airport is 1hr 20mins. From Bradworthy square, follow North Road out towards Hartland / Meddon. Continue to the very edge of the village where The Old Granary will be seen on the right hand side just before Crosspark cross. © Barnsetc 2019. All rights reserved.